“I know you”, she says, pointing a finger at me as she opens the front door. Hmmm. Is she a dedicated follower of my top-class website? Seen me give an inspirational talk somewhere? Or perhaps I’m jsuit the only person to have booked in some work on a bright yellow rickshaw that morning. “Eh, that looks light”, he says with a grin as broad as his accent. “Lightest one on the market”, I come back with, looking at a fully laden rickshaw. Mike, of Mike’s Bikes in Aviemore, precedes to make swift work of replacing the brake adjustor and switching the old pedals for some clip-in ones. My food supply weighs more than that. I’m setting off from the bronze statue on the village green that was installed in tribute to the town’s Olympic athletes. I’ve heard that per head of the population, Aviemore has one of the highest percentages of Olympians in its history. A local reporter asks me if I’ve got any thing left to fix and I tell her the front brakes aren’t working properly. “Oh God!”, she says, “I don’t want to read about some nice young man knocked off his bike on the A9 in tomorrow’s papers”. I tried to explain that the problem was that they wouldn’t come off rather than that they wouldn’t come on but I think the damage had been done. Silly, really, since this challenge of sorts is well, silly. I’m not scaling a new mountain or crossing a dessert. 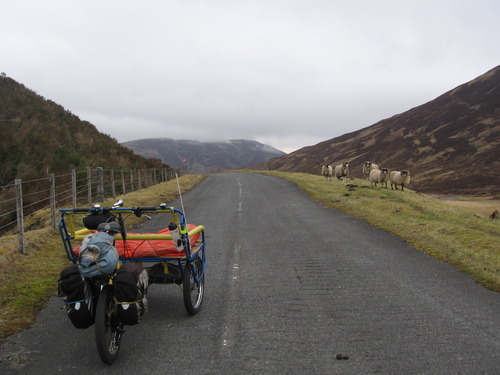 I’m cycling a three-wheeled novelty bike back home from Scotland. But I’m actually feeling a little sick and my mind is in a messy turmoil. Nothing else for it. Got to get going. Given that my top speed seems to be 7.5mph, it turns out that front brakes aren’t really that crucial. My biggest enemy appears to be a headwind. “Not very aerodynamic is it?”, notes a lady in Kingussie helpfully. Quote of the day: “No, it’s not a tractor”, dad to his son on seeing me pull out of Tesco car park.